As more than 100,000 tourists descend on Daytona Beach for Speed Week, the city is going through an unprecedented crackdown on panhandling. Capri said six people were hit by cars last year while panhandling and stressed this is a public safety issue. Besides panhandlers, Capri noted that tourists and residents are also put in dangerous situations. Based on feedback from the community, the ordinance bans panhandling near ATMs and 20 feet from any business. Capri said aggressive panhandling could hurt Daytona Beach’s tourism. “People are like, ‘look, I feel threatened, intimidated. I’m scared.’ They’re not going to come back to Daytona Beach,” he said. The ACLU does not like the new panhandling law. Cary Ragsdale chairs the “Justice for the Homeless Committee” of the ACLU of Volusia and Flagler Counties. Ragsdale said feeling safe and comfortable is not a right–but free speech is. Being safe is a constitutional right that Ragsdale acknowledges and believes in. 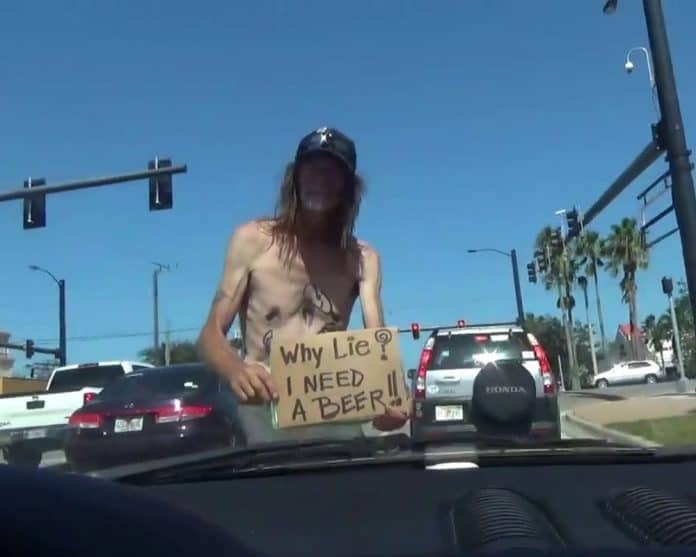 Stressing that he wants the public and panhandlers to be safe, Ragsdale insisted Daytona Beach can accomplish that goal without taking away rights. Capri said the city isn’t trying to kick out the homeless, adding that most of the begging that happens in Daytona Beach isn’t even by people that are homeless. In the meantime, the ACLU is ready to go to court though Ragsdale said the group hoped to find other alternatives. In the meantime, Daytona Beach looks ready for a legal challenge. While the legal fight may be just beginning, so is the battle over panhandling on the streets. From Feb. 6 through Tuesday, 26 people were arrested for violating the ordinance. Since it is not a felony, some of them will get time served after a night in jail or other slaps on the wrist. Capri said the police will do their duty no matter how quickly panhandlers get out of jail.